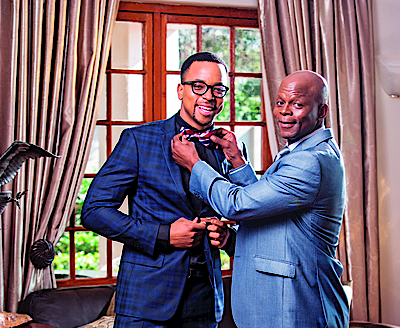 HE’S one of the most respected and popular soccer legends in South African history, but when we meet him at The View Boutique Hotel in Auckland Park we see a different side to the businessman Marks Maponyane (51) – a humble, down-to-earth side that we hadn’t expected. Even though Marks is a busy man, he doesn’t like to disappoint people. Professionalism and punctuality mean a lot to him, and he’s spot on time for the DRUM shoot. A few minutes later his son, model Masego “Maps” Maponyane (23), walks in with a smile and confidently takes the initiative by greeting everyone. Greeting his father, he calls him Mr Maponyane as he shakes his hand, showing the respect he has for his famous dad.Although they have an easy-going relationship, there’s a boundary of respect between them. “Respect is very important to me and I taught my children to always show respect towards everyone, and most importantly to never forget where they come from and who they are,” Marks says.